Playtech’s latest Marvel offering, Ghost Rider, boasts beautifully rendered graphics, a pumping soundtrack and a lively intro. So what are you waiting for? Let’s rev that throttle, get cruisin' and let some ghosts feel the burn! Play Ghost Rider for Real Money! 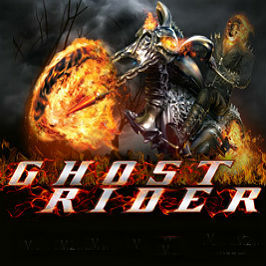 If you like your slots dark and dynamic then Ghost Rider is bound to set your world on fire. Based on the hugely popular comic book (and slightly less well-received Nicholas Cage movie of the same name), Ghost Rider sees you take the role of John Blaze. This tormented motorcycle stuntman sells his soul to save the life of a loved one and transforms into a fiery, avenging agent of justice, committed to combating evil demons wherever they roam. After being catapulted into the game via a rip-roaring cinematic opening, Ghost Rider gives you the option of playing in both free and real money modes, with the latter on hand from 20p to £100 a spin. If you’ve played any of Playtech’s other franchise games like X-Men or Blade then you’ll undoubtedly appreciate the reassuring familiarity of the five-reel and 20-payline setup. All of the in-game symbols, such as Mephisto, the flaming skull and of course the Ghost Rider himself, resemble elements from the movie. The Ghost Rider is a wild symbol that can really set the reels on fire. When this dynamically cool symbol appears on the middle line, it activates the reel. Activate all five reels and you’ll get a shot at the Ghost Hunt Bonus feature. This is a rather innovative game that lets you play as a cool animation of the Ghost Rider, cruising Brando-like on his motorbike towards the horizon while trying to shoot down trouble-making ghosts that pop up to the left or right. You get ten attempts to shoot them down, with a successful shot netting you up to three times your stake. The mechanics of the game mean you’re likely to shoot a minimum of seven ghosts with your ten shots, so you can look forward to winning at least 30 times your stake. There’s also a fun Free Games feature, which is triggered whenever three or more Ghost Rider logo scatter symbols pop up on the reels. This proffers ten free spins with a 3x multiplier. Get three or more scatters during your free spins and you’ll receive an additional ten free spins, again with a 3x multiplier. The great thing about this potentially lucrative perk is that the number of additional free spins you can get is effectively unlimited! As with all of Playtech’s other Marvel slots, the Ghost Rider jackpot (10,000 game coins) is part of a pool of four progressive jackpots: the Power, Extra Power, Super Power and Ultimate Power. This stage can be triggered anytime during the game. Needless to say, betting larger amounts generates greater chances of pocketing handsome jackpot winnings. If you’re looking for an engaging casino game that promises great visuals, fun features and some potentially lucrative rewards, the Ghost Rider online slot machine from Playtech may just be the perfect fuel for your fire. Share this Ghost Rider Review today! If you like Ghost Rider, you'll love these slot titles too!